This post serves a dual purpose: celebrating a week of creating a new classroom space and DigiLit Sunday topic, preparing for the new school year. Find other celebrations at Ruth Ayers’ blog Discover, Play, Build and DigiLit Sunday posts at Margaret Simon’s blog Reflections on the Teche. I have an old pair of sandals. They’ve given me miles of comfort. In spite of new purchases, my old pair finds its way back into my life and onto my feet. They are worn just right and fit my summer feet. My classroom has well-worn objects as well. They are irreplaceable. This week I celebrate the old that serve every school year. The easel I found in an abandoned hallway my third year of teaching has held hundreds of pieces of paper. Smartboard technology tried to replace it, but a physical chart, made with students, that hangs on the wall as evidence of thinking, that doesn’t disappear with the next lesson, has value an electronic screen can’t match. This old tool takes any piece of paper and makes it the centerpiece of instruction. The wooden stools I bought at IKEA my second year of teaching have survived and served hundreds of fifth graders as chairs, tables, impromptu meeting areas, foot stools, outside classroom space, and props in dramatic plays. These old tools allow students to create the space they need. The bookshelves and book bins have been with me since the beginning. Bookshelves can entice readers into a cozy nook. Bins are transported to the carpet, to a table, to a corner. They can morph to hold any genre. These old tools are the superheroes of the reading and writing workshop. The books on the shelves will be sought after and loved. Sadly, these books aren’t as resilient as the bookshelves and bins, but their messages endure and speak to kids year after year. Because of Winn Dixie, Tiger Rising, Flying Solo, How to Steal a Dog, Wonder, Firegirl, The One and Only Ivan; series like I Survived, Shredderman, The Treasure Hunters, Vet Volunteers are just a few. These old tools transport students. I cherish the old. But sometimes we need new. This week I’m celebrating things that revitalize our lives. I have a new pair of running shoes that have given my running new life. The old pair is broken down and can’t provide the support I need. Sometimes new is necessary. This year, I’m bringing in new that support the old and signal new beginnings. I’ve found new strategies from professional books I’ve read over the summer. A “next generation” balanced literacy approach allows kids the space to show what they can do before we teachers jump in with the instruction. Talking less so kids can do more has been my mission ever since I read What Readers Really Do by Vicki Vinton and Dorothy Barnhouse. Jan and Kim’s book has opened my eyes to the power of shared reading. Shared reading isn’t just for little kids. This year, I’m building in more shared reading time around their read aloud time to support transfer. DIY Literacy by Kate Roberts and Maggie Beattie Roberts. I wrote about this book here and here and here. I believe the tools we will build with DIY thinking will empower students to do the work with self-made goals. This year, I’m finding places and making time for students to create bookmarks that are supported by the micro progressions, charts and demonstration notebook. The Journey is Everything by Katherine Bomer. The essay work Bomer speaks to is one that grows over time. It is the journey we want our kids to take as readers and writers. This year, I’m building in time to notice and notebook so ideas can grow over the year, not just in a unit of study. To contain and support all of this new thinking we need new school supplies. Notebooks, pens, markers, post-its. They are ready and waiting. The old tools have strength. They are flexible and tough. Like my sandals. They serve no matter the group of students. I cherish them. But every year, I find new ideas that support and enhance. Like my running shoes, sometimes the old needs to be updated. Sometimes new is necessary. I look forward to both the old and the new sitting side by side. I just love the way you weave the words to tell the tale of the old stand-bys and the new bits working its way into your instruction. What a great year you will have! Making good decisions with the best practice of the past that interacts with new ‘best’ practices means you are a lifelong learner as you want students to be, too. I liked your thinking, Julieanne, and wish you a wonderful new school year! what a great photo and reflection! Nicely done. This time of year is so special….definitely my “new year’s” far more than Dec 31st which I usually sleep right through. Sounds like you are refreshed and ready to go. I know you will have a great school year. I love the compare and contrast and metaphorical style of your post! You are ready to go! Enjoy the start of your school year and enjoy breaking in your new running sneakers! This image of your classroom is a comfortable inviting place to be. I love the way you crafted this post, old and new. Thanks for linking up with DigiLit Sunday. Love this, Julieanne – old and new, what we loved and what will will love. “I cherish the old. But sometimes we need new” and words like revitalize! I loved reading this post. It really hits home as I set up my own new old space for students… thanks for sharing. I have so much I cling to and cherish as well that will always be part of what I do… but looking forward to leaning to love some new as well. I love the way you crafted this and I also appreciate the old and familiar as well as the new and exciting! I’ve also been trying to read a lot this summer and soak in “new” ideas and advice for the year ahead, marrying that with the “old” strategies and beliefs that I need to hold onto! I love the way you included the old and the new and the importance they both in our lives…from running to teaching to enjoying summer days. This summer was filled with learning and I can’t wait to see how everyone implements these new ideas this school year. What a great post! The old and the new both have places in our classroom. I purchased DIY Literacy because so many people have been talking about it. I’ll get to it soon! I’m also reading The Journey is Everything, which is giving me lots to think about! Love how you wrote your comparisons! So much to treasure here in both the old and the new. And TOO FUNNY that we have some of the same sources! Your list is much more succinct! your old and new comparison post is filled with thoughts that transition well with each paragraph. It’s a great read as we move into a new year. Best wishes for a wonderful start, Julieanne. This summer I realized that I hold a healthy tension when it comes to adding new tech into my life- both teaching and personal. I had a flip phone until last year! I only got cable television five years ago. I guess I am a late bloomer. This summer I learned how to use twitter, created a blog, and am inserting myself in very exciting places on the web to learn and meet new people. 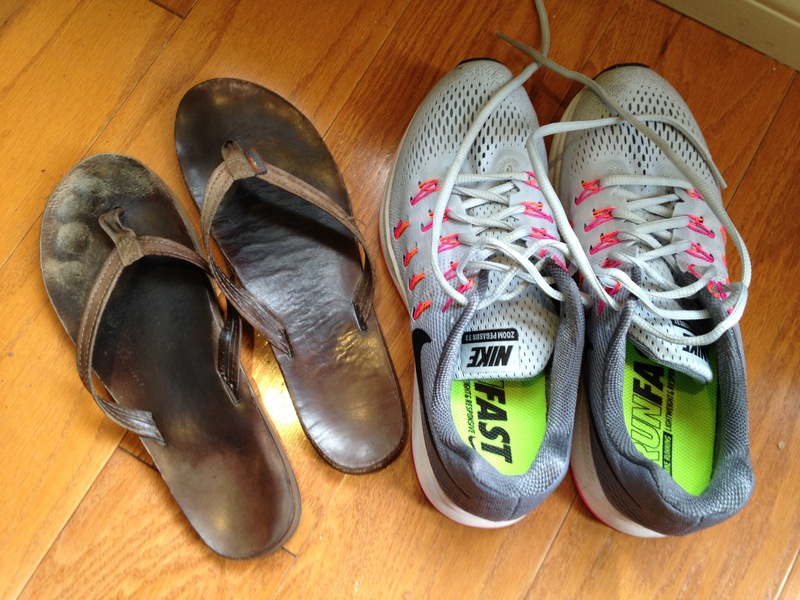 I think for me, it is cold turkey time- I’ve gotta throw out those “sandals”. Thanks for the post. I love how you describe the tension you feel between old school and new tech. I think it’s healthy to moderate each with an eye for growth and learning. What we love and have loved is always a part of what we are learning to love. I smiled at the two pairs side by side.